What is the value in creating a Plugging & Abandonment (P&A) collaboration forum? OTM Consulting, owner of 10 oil & gas industry networks and manager of a further 4, is proposing creating a new collaboration forum focusing on P&A. We canvassed our contacts to ensure that there was sufficient need for collaborative working in this area to assist in overcoming significant industry challenges. The response was overwhelmingly positive, with clear support for launching the forum in September 2016. P&A has no tangible value to the operator but has significant costs. With the low oil price appearing to stabilise around $50 and an increase in the number of wells that require abandonment, the major focus is on reducing costs while ensuring safe and reliable P&A operations. The key drivers highlighted in OTM’s survey response were cost effective plugging and sealing, rigless P&A and barrier verification & multi string logging. The breakdown of response are shown in Figure 1. To date, 81 individuals (from 19 operators and 27 service companies/vendors) have responded to the OTM survey and discussion paper either via email or by completing the web based survey. 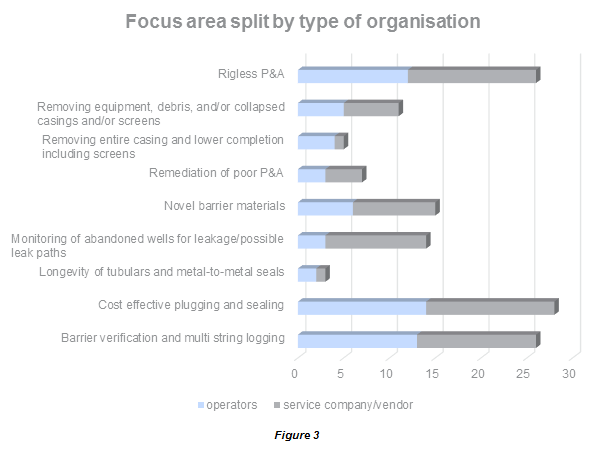 The majority of participants had an interest in P&A as seen in Figure 2, even if it was not a current priority area for their organisation. The key focus areas had equal support from both operators and service companies/ vendors as shown in Figure 3 below. In order to address the three groups of challenges listed above, OTM will be launching the P&A Collaboration Forum in September 2016. The forum will enable key individuals to come together and discuss their biggest challenges and how to work together to achieve cost-effective solutions. From the 39 respondents, 28 believe that if OTM was to launch the P&A Collaboration Forum their company would be interested in becoming a member. The respondents reflect an almost 50:50 split of operators and service companies/ vendors as shown in Figure 4. Of these, 19 indicated that they would be interested in becoming founding members to launch the forum in September 2016. Following engagement with the interested parties, it became clear that the regulatory requirements and technical challenges are inextricably linked. Although there would be the provisions for working groups within the forum to develop global industry guidelines or recommended practices, there is a far more immediate need to share understanding on the interpretation of regional requirements. With collaboration amongst the broader user base, there will be impetus for increased technology development as the wider challenges become clear. The survey responses in Figure 5 show the importance of addressing both the global regulations and the technical challenges. To address the challenges associated with operational best practice, OTM believe a knowledge sharing forum is essential where individual member companies (operators and service providers) can describe the challenges they face and how they have overcome them. There have been a number of attempts to address this within the industry by creating databases of previous P&A operations, however this is onerous for the operator to complete and results in incomplete data sets. Although there are forums for P&A/ Decommissioning in the UK and Norway (run by operators, the OGA, Decom North Sea, SPE, ICOTA, ITF and Oil and Gas UK), none of these are global knowledge sharing forums. Acknowledging that operator resources are tight, OTM will ensure that our initiative provides real value to the membership and does not duplicate the work of established forums. An open, honest forum where experience of non-competitive operations can be shared across the globe will benefit the whole industry. There will also be opportunity to pose questions and challenges to the attendees, benefitting from a wide cross-section of experts from different regions to develop innovative and cost-effective solutions. In response to the clear need from the industry for a global plugging and abandonment knowledge sharing forum, we are planning to launch a new network from Houston on Tuesday 20th September 2016. We have had conceptual support of this initiative from 5 International Oil Companies during the discussion meeting on Monday 27th June, and will be distributing details on how to become a member of this global collaboration environment in the coming weeks. If you would like to be kept up to date with the P&A forum, please click here.